Nagyon jól éreztük magunkat. A Hasik prospektus annyira tetszett Abigélnek (13 hónapos), hogy elvittük emlékbe... :-) 2016.09.14. We provide an undisturbed environment, perfectly-equipped conference rooms and flexible and helpful service staff for your successful indoor trainings and seminars. Nowadays more and more companies and firm managers believe that trainings, team building activities and seminars are a worthwhile investment in the future. This approach of multinational companies which put great emphasis on the constant development of their work force has enhanced the training market in Hungary, too. Moreover, the representatives of the small and medium-sized companies have also begun to appear among our guests. The hotel staff has had a fifteen-year old experience and references from Top 100 companies as well as leading training organizing firms. The size of the hotel makes it an ideal place for conducting both indoor and outdoor trainings for an average size audience. Therefore the hotel has deservedly earned the title as “a training and conference hotel”. Our hotel provides a wide range of training opportunities including small group seminars or one-day gatherings of company associates with their whole families up to 70-80 employees. 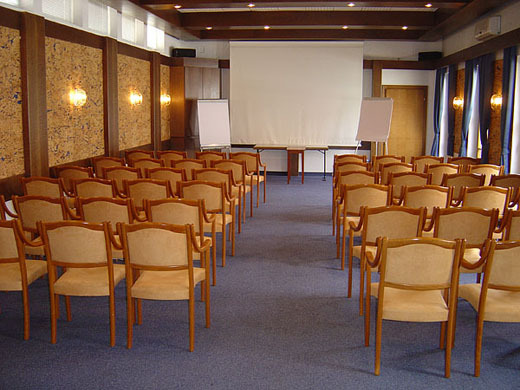 In case of 60 participants or more, the hotel can guarantee exclusive conferences with full room and service facilities for our guests (conference, workshop, team building, indoor and outdoor programmes, wine tasting, live music in the evening, karaoke party, performance, elongated wellness opening hours, riding). The hall is lit by natural light on both sides. The 75 square-meter-large hall is air-conditioned and can host 70 guests as an auditorium room or 35-45 guests at an U-shaped desk or in an island like arrangement. 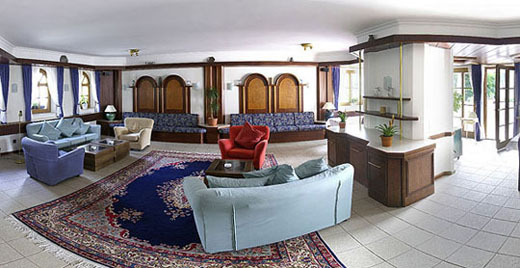 In the coffee break the guests can have mineral water, refreshments, sandwiches and cakes in the hall and smokers can have a cigarette in the nearby Himfy room or on the terrace. The room can hold 35-50 guests. It is air-conditioned and naturally-lit with an exclusive appearance and professional equipment. It is an excellent premise for carrying out team building activities, workshops or seminars. In the coffee break the guests can have mineral water, refreshments, cakes, sandwiches and some small snacks in the hall and smokers can have a cigarette in the park which can be directly accessed from the room. The lounge which has the atmosphere of that of a knight’s hall can hold approximately 40 people. It is an ideal place for discussions, lectures, business and private meals as well as less formal discussions, team buildings and workshops for smaller groups. Coffee, refreshments and mineral water and some snacks can also be served in the room. The terrace can be directly accessed. There is a free Wi-Fi hot spot for our guests arriving with portable devices within the whole area of the hotel including the three conference rooms. We invite our guests to take part in some outings in the close vicinity of the hotel where with the help of the natural and built surroundings (castle ruins, wood, stream bank, riding arena) they can get to know each other and themselves in a novel, different perspective. In the open air under quite different circumstances from those at home and at work beyond getting to know and understand each other the experiences gained as a member of a community, the tasks solved together, the satisfaction felt as a member of a team and the evoked creativity together all aim at enhancing company loyalty and team spirit. This common, however, at the same time individual experience gain as well as the significance of individual efforts added up during team work help everyone understand the essence of the team as a unit based on cooperation. Hotel Hasik organizes outdoor team building activities in co-operation with its professional expert partners. 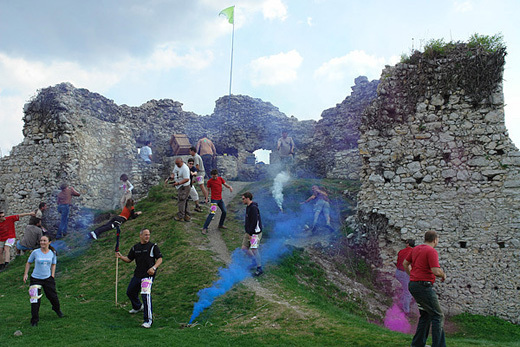 The quality of these events is enhanced by the unique landscape of Bakony, the undisturbed environment in Döbrönte and the ruins of the Himfy Castle just opposite the hotel, which all lend an exceptionally unique atmosphere and location to the training. The services at the hotel, furthermore the wide range of outdoor recreational activities in the vicinity also contribute to the fact that finally everybody will find the most suitable team building programme for their associates. Team building, traditional Hungarian pig killing, cooking (maximum up to 20 people). Those who would like to test their dexterity can visit the biggest adventure park in Hungary called Sobri Jóska full of zip-wire rides and special items of fun.